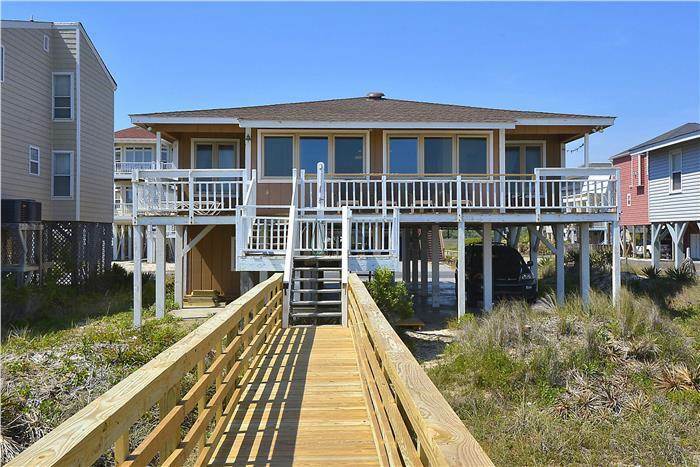 Cute and cozy beach cottage on the oceanfront with a direct walk to the beach. 5 Bedrooms and 3 full bathrooms. Large open living area and kitchen. Two bedrooms share a bath on the east and west sides of the main living space. Downstairs is the fifth bedroom with separate entrance to the outside (no interior access). The fifth bedroom has its own private bathroom (no bathtub). There is a washer/dryer and a second refrigerator located in a separate ground level area with no interior access. Other amenities include central heat and air, tile floors throughout, 5 televisions, 2 DVD players, dishwasher, microwave, outside h/c shower, and wireless internet. Non-smoking. Dock Rental (close by) is available for additional weekly fee of $150. Please inquire about dock availability if interested. Accommodates 12. K, 2D, Q, Q, 2T (downstairs separate entrance). All bed and bath linens included in the rental of the property. We had a great time at the ocean front cottage 356 east 1st. The location and accommodations were good. We plan on booking another trip at Ocean Isle this year.